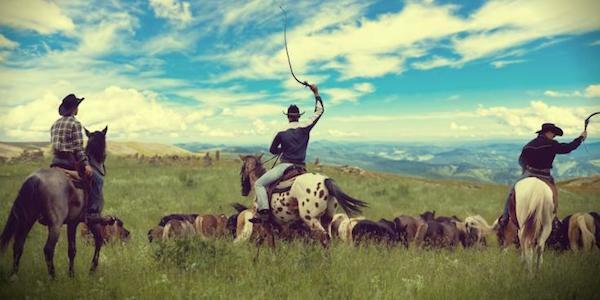 When we think of frontiers, two images often come to mind: cowboys and space. And as it happens, both hold clues to how the world is simultaneously facing the most severe crisis since the threat of nuclear annihilation and being reinvented through business pushing the boundaries of possible solutions. One of the first to realize that a radical rethink was necessary was U.S. economist Kenneth Boulding. In 1964, Boulding described how most companies behave as if they are riding on the infinite plains of a “cowboy economy,” where there are no restrictions on growth, resource consumption or waste generation. Their endless appetite for expansion and profits is seen as just reward for being the “quickest draw” in a free market where gunslingers are king. A few short years later, the 1972 Limits to Growth study aimed its foreboding critique directly at those cowboy executives who thought that the good times could last forever. It is not surprising that space — “the final frontier” — also has captured the public imagination, with Kennedy’s Apollo mission finally succeeding in putting a man on the moon in 1969. Once again, Boulding had foreseen the power of this metaphor and proposed the “spaceman economy” as an alternative to the reckless “live-fast, die-young” model of the “cowboy economy.” These were some of our first glimpses — along with Barbara Ward and Buckminster Fuller’s “spaceship earth” metaphor — of the sustainability frontier. Now, over 50 years later, the cowboys are still with us and, if anything, they are bigger and more dangerous, with their multinational reach and multibillion-dollar budgets. But sustainability also had advanced rapidly and is now pushing the limits. In fact, sustainability is now fundamentally changing the way business functions in society across eight vital frontiers. In “Sustainable Frontiers,” I explore how we must find ways to let go of an industrial system that has served us well, but is no longer fit for purpose. The Transformational Leadership Frontier is where we are starting to understand that all change begins with leaders who are willing to place an inspiring purpose at the heart of their company’s mission. In research I conducted with Cambridge University, we identified key characteristics of leaders for sustainability. Yet a study by Cranfield University shows there is still a massive generation gap between current and future leaders’ belief that they are adequately delivering a social purpose through business. The Enterprise Reform Frontier is about the wave of alternative business structures that are challenging the notion that companies must exist exclusively to serve shareholders and make profits. Whether it is the hundreds of thousands of cooperatives that employ 250 million people worldwide, or the 1,200-plus new brand of B Corps (for benefit corporations), we are learning that we can remake companies to reflect our values and to drive positive change in society. Online fashion retailer Zappos is a good case in point, with their promotion of “holacracy” as a self-organizing company structure, where they have a hierarchy of purpose rather than a hierarchy of management. The Technology Innovation Frontier is where breakthroughs in process and product design are making the aspirational goals of zero negative or net positive impact less of a dream and more of a reality. This is also where we are learning about the power of collaborative, open innovation, whether from X-Prize or Virgin Earth Challenge type initiatives, or from multi-stakeholder partnerships such as the Cassava: Adding Value for Africa (C:AVA) Project. The Corporate Transparency Frontier is driving reporting down to a full value chain, product lifecycle level, with early runners such as Patagonia’s Footprint Chronicles and Nike’s “Making” App, powered by the Nike Materials Sustainability Index (MSI), a database that was created using publicly available data on the environmental impacts of materials. Meanwhile, transparency in the supply chain is being championed by sites such as Howstuffismade.org and Things.info. The Stakeholder Engagement Frontier tracks how social media is changing the game of how companies interact with interested and affected parties. Crowdsourcing platforms such as Convetit and Wikipositive are providing a new way to consult with experts on social, environmental and ethical issues, while self-organizing activist sites such as Knowmore, Star Communities and Wikirate.org are raising the knowledge and power of customers and communities. The Social Responsibility Frontier is rapidly shedding old-style defensive, charitable and promotional CSR in favor of more strategic and transformative approaches. Companies around the world are applying the five tests of CSR 2.0 — creativity, scalability, responsiveness, glocality and circularity — with hotels such as Kandalama and garment manufacturers such as Bodyline in Sri Lanka showing that transformative CSR is not just a Western phenomenon. The Integrated Value Frontier is showing that companies can go beyond integrated reporting to integrating social, environmental and ethical criteria across their whole business — from stakeholder needs assessment and leadership goals alignment, to risk and opportunity analysis, business process redesign and management systems integration. As the name suggests, integrated value creation is also good for business — cutting costs, increasing stakeholder satisfaction and growing new markets. Finally, the Future Fitness Frontier is where businesses are developing compelling visions for a better world — that is safe, smart, sustainable, shared and satisfying. Take Elon Musk’s vision, for example, which is to “help expedite the move from a mine-and-burn hydrocarbon economy toward a solar electric economy” through Tesla Motors — and now also Tesla Energy. Simultaneously, business is developing resilience strategies for coping with a more volatile future. So much of making a successful transition to a more sustainable future depends on letting go. How we will need to let go of old styles of leadership and outdated models of business, along with high-impact lifestyles and selfish values. How we must learn to let go of cherished ideologies that are causing destruction and beliefs about ways to tackle problems that are failing to resolve crises. It is no wonder that we are scared to let go. Many of us are comfortable clinging to our consumptive habits and selfish behaviors. Besides, the future is uncertain — and our greatest fear as humans is a fear of the unknown. We would rather trust (and fight to protect) the present we know than gamble on the future we don’t know. And yet, as academic Jarred Diamond has documented in Collapse, civilizations that fail to change are civilizations that ultimately fall. Similarly, historian Arnold Toynbee points out that the decline of civilizations starts with the failure to open the public and political mind to new possibilities. People become trapped in a paradigm — literally, a pattern of thinking — and are closed to a different, emergent worldview, despite mounting evidence supporting the new reality. If we are to reach sustainable frontiers, therefore, it must begin with changing our collective minds — and only then will we change our collective behavior. How we accomplish such a global mind-shift is the subject of this book. It starts by admitting that those of us at the vanguard of the sustainability revolution also have to change. We will have to let go of cherished beliefs and strategies that are not working — starting with the way we communicate our vital, life-saving mission. Visser, W. (2015) Cowboys, spaceships and CSR 2.0, GreenBiz, 23 May 2015.